The Italian Cover of The Good Son! Introducing the Finnish cover of The Plotters! Welcome Krys Lee to the Barbara J. Zitwer Agency! 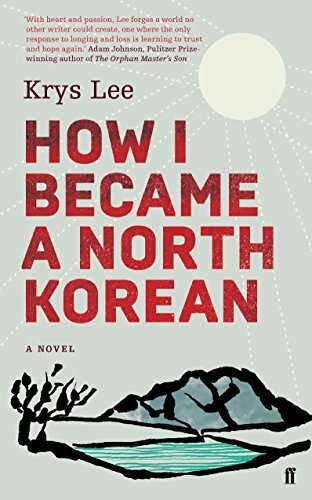 Krys Lee is the author of Drifting House and How I Became a North Korean. She is a recipient of the Rome Prize and the Story Prize Spotlight Award, the Honor Title in Adult Fiction Literature from the Asian/Pacific American Libraries Association, and a finalist for the BBC International Story Prize. Her fiction, journalism, and literary translations have appeared in Granta, The Kenyon Review, Narrative, San Francisco Chronicle, Corriere della Sera, andThe Guardian, among others. She is an assistant professor of creative writing and literature at Yonsei University, Underwood International College, in South Korea. 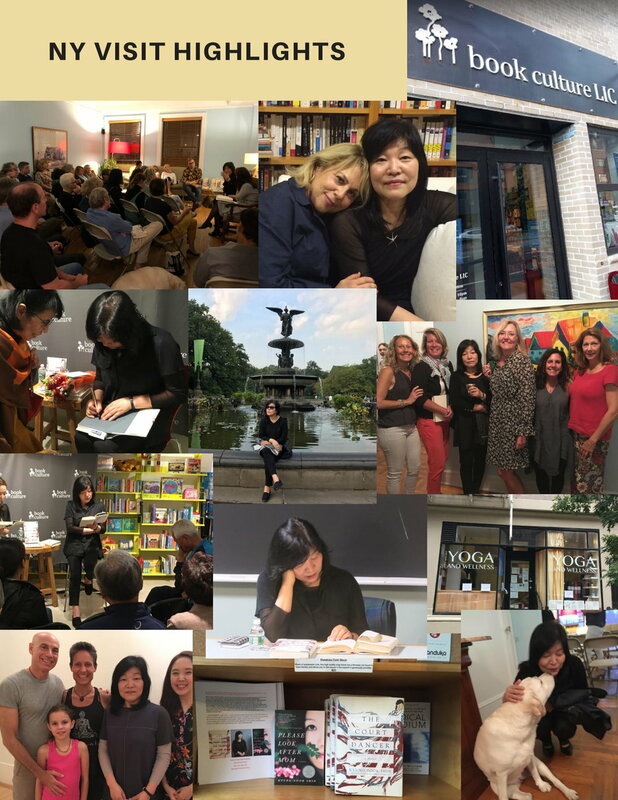 A wonderful evening with Kyung-sook Shin at Upper Westside Yoga Wellness. Thank you so much Stephen and Ingrid for hosting and inviting Shin. Kyung-Sook Shin Reading on 9/25 at Boston University! The 52-year-old, one of South Korea's best-selling thriller writers, says in an e-mail interview through a translator: "Something hot and heavy rumbled at the bottom of my chest and I couldn't breathe. I began to wail. Never before or since have I sobbed like that over a book." She decided then that she wanted to write stories so absorbing, they would make readers forget where they were. "I want them to spend all night, their souls burning, and greet dawn, spent. I want the world to burn with passion through me." Jeong has delved into the darkness of the human mind in her novels, from vengeance-twisted fathers to serial killers. "The darkness of humanity is the force propelling my work," she says. "The Plotters hums with menace, humor, heartbreak, and savagery. The killers and schemers haunting its pages range from dens of villainy to desperate scenes of quiet domesticity, offering a view of the world from the depths of its own shadow. The result is wild, weird, and completely engrossing." "The Plotters is what would happen if you took the best South Korean crime cinema and distilled it into words. A smart but lightning fast thriller that keeps the pressure on to the very last page." "Imagine a mash-up of Tarantino and Camus set in contemporary Seoul, and you have The Plotters. Filled with unexpected humor and exquisite fight scenes." Helen Garnons-Williams at 4th Estate has pre-empted Marilyn and Me by Korean author Ji-min Lee. 4th Estate has UK and Commonwealth rights through Barbara Zitwer, and will publish in May 2019. The translator is Chi Young Kim, responsible for the English version of Please Look After Mom by Kyung-sook Shin, winner of the Man Asian Literary Prize. Mary Gaule at Harper Perennial signed NA rights. Emily Hayward-Whitlock of the Artists Partnership in London is handling film rights. The novel centres on Alice, a translator for the American forces in Seoul who is asked to interpret for Marilyn Monroe as the actress visits Korea for a tour. Alice is also inveigled into becoming the bait in an operation to entrap a communist spy. Garnons-Williams said: "[A] compelling and surprising story of damage and survival, grief and unexpected solace... Alice, raw and wry and wearing her grief like armour, is a wonderful character, and her experiences offer a fascinating - and timely - insight into an extraordinary time and place. We are thrilled to be publishing this darkly beautiful novel." The two sides to The Good Son are told by mother and son. Once Yu-jin discovers and begins to read his mother’s journal and offers the reader his own take on each chapter of the story that she tells, stroke by (alternately conflicting and complementary) stroke a more complete picture is formed. The final mystery of The Good Son is genre. Is it a psycho-noir or a tricky amnesia-tinged locked-room mystery? Either subgenre can support unreliability on the part of the narrator, and even after crucial bits of memory are recovered the mystery remains until the resolution. And that resolution is satisfyingly chilling and, depending on the reader, thrilling. Read the full review on LA Review of Books. THE COURT DANCER by Kyung-Sook Shin, THE GOOD SON by Jeong You-jeong and THE WHITE BOOK by Han Kang all discovered and sold by Barbara J Zitwer Agency ! A compilation of reviews for Women in Translation month (August 2018). NPR...[an] atmospheric, tragic novel ... Sorrow threads itself through the pages of The Court Dancer, yet there is a richness both to the period and the narrative as beautiful as any silk fan. Kyung-Sook Shin has become one of South Korea's most popular authors, and for good reason. Her deep understanding of the subtleties of the human heart effortlessly crosses borders and informs her portrait of a different place and a faraway time. BOOKLIST ONLINE...Orphaned but adoringly raised by a royal attendant’s sister, coddled since childhood by the queen, taught French by a missionary-priest, Jin leaves Korea and settles in Paris. Her new life provides unimagined social, literary, even commercial opportunities, but the relentless exotification of her very person emphasizes her growing alienation. Her return home is bittersweet, as she’s treated like a foreigner, but events turn horrific when she’s caught in the violent Japanese takeover of the Joseon court ... The Court Dancer’s latest journey west should command substantial, eager audiences. Inspired by the true story of a late-19th-century court dancer, Shin’s novel explores themes of exoticism, assimilation and identity ... The novel delves into major historical events, including 1884’s Gapsin Coup and the Imo rebellion in 1882, while the power struggle between China and Japan for influence over Korea looms in the background. By placing Korean history beside a Western narrative, Shin highlights the disparity between Europe and the more isolated Asian nation. At its core, The Court Dancerexamines what countries lose in identity in exchange for technological advancement. Yi Jin finds herself at the heart of the diplomatic, aristocratic, and artistic circles of Paris in the Belle Époque, writing her detailed observations of Paris life in unsent letters to Queen Min, embroidering fans to be sold at the Bon Marché department store, and spending time in the company of writer Guy de Maupassant – playing chess, going for walks, and even visiting the Paris morgue (a popular 19th century tourist destination) ... 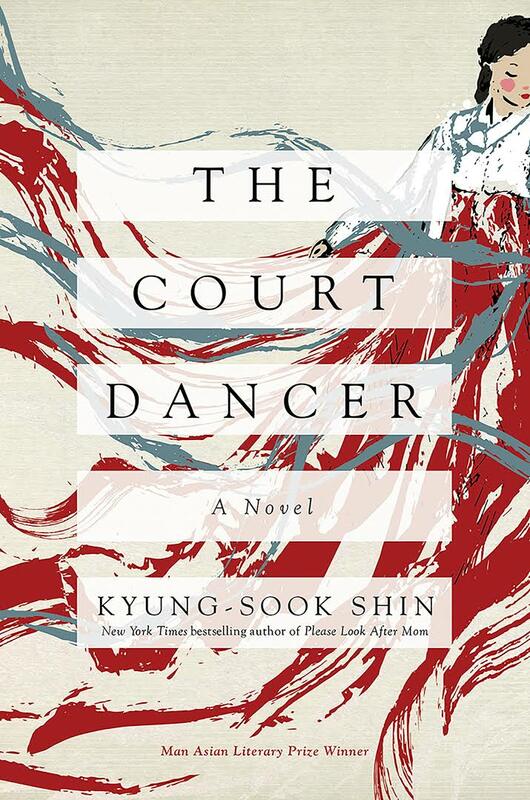 In The Court Dancer, Shin Kyung-sook offers a rich and detailed look at 19th century France and Korea though the eyes of Yi Jin. Jin is a keen observer of everything around her ... Shin’s novel has a power that stems from the idea that, in the whirlwind of grand, worldly events, sometimes, the smallest, most unpredictable things can change the course of a life. The book is a fascinating woven account of Jin’s and Korea’s simultaneous navigation through the final years of the Korean Empire. 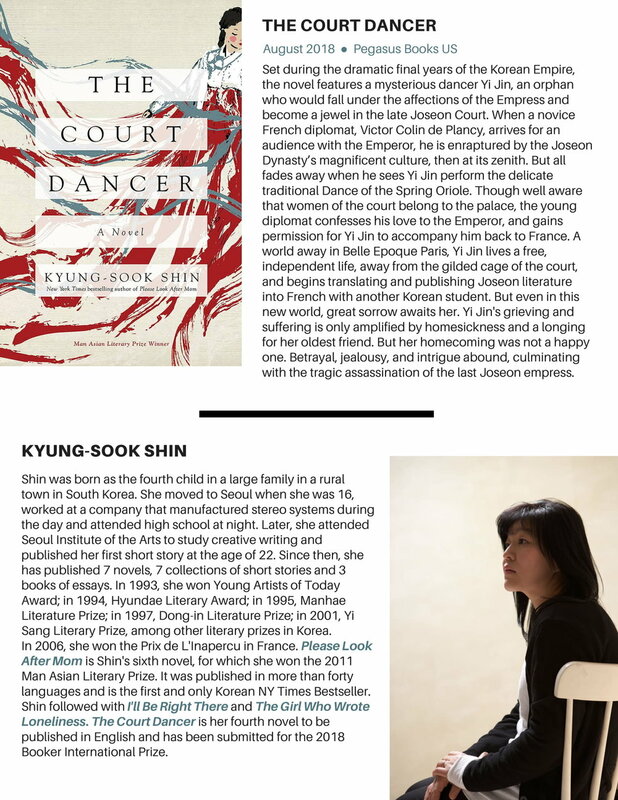 Congratulations to Kyung-sook Shin on the publication of THE COURT DANCER with Pegasus Books, US! Congratulations to Un-su Kim on the publication of THE PLOTTERS with TEXT Publishing, Australia! Un-su Kim is the rising star of Korean literature. With shades of Murakami, The Plotters is a complex, fascinating moral tale about the changing of the guard in a corrupt underworld—a page-turner filled with black humour and compassion for a fallen world. If ever there was a novel to keep readers on their toes it is this one. I was captivated by The Plotters‘ kaleidoscopic contradictions. From the sensitive, bookish souled Reseng who ‘grew up in a library crawling with assassins, hired guns and bounty hunters’ and taught himself to read despite his guardian Old Racoon warning him ‘reading books will doom you to a life of fear and shame’, to the trackers, plotters and myriad other puzzling characters that inhabit the meat market. Dirty, rank, wretched and revolting. That was the meat market. Pointless compassion and sorrow, endlessly spawning apathy, and aimless pent-up anger swept around like dead leaves in autumn until ultimately self-combusting. The final stop for fallen lives. Can a description of filth and scum be more evocative, more poetic and lyrical? I think not. Can readers feel empathy for characters who choose to fund their lifestyles from the misery of others? One would think not, but yes you can… if the characters (and context) are as well developed and multifaceted as Un-su Kim’s. It takes great skill and nuance to pull something like that off. And remember, this is a novel in translation. Bravo Sora Kim-Russell. Murder was quiet and simple in the plotting world. There were no huge explosions like in the movies, and rarely any messy car accidents or hails of bullets. It was as silent as snowfall in the night, as secretive as a cat’s footsteps. The winners of the 2017 Shirley Jackson Awards have been announced! The Shirley Jackson Awards are literary awards celebrating the legacy of author Shirley Jackson (1916–1965) and are handed out at Readercon. each year. The Shirley Jackson Awards are awarded in recognition of “outstanding achievement in the literature of psychological suspense, horror, and the dark fantastic” during the previous year. The winners are appointed by a jury of editors, writers, critics, and academics. 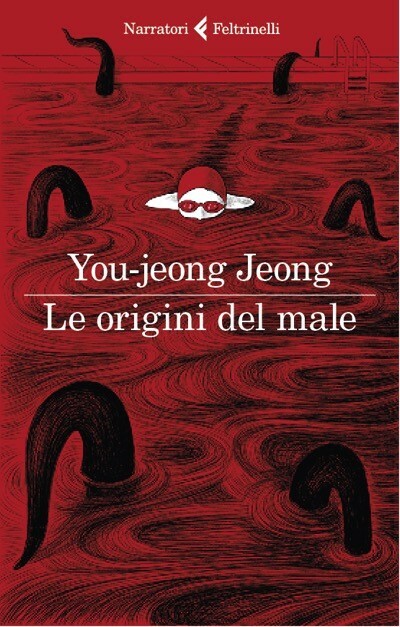 The 2017 Shirley Jackson Award for best novel went to The Hole by Hye-young Pyun (Arcade Publishing) in translation by Sora Kim-Russell. Meanwhile, the award for best novella ended in a tie between Samantha Schweblin’s Fever Dream (Riverhead Books) in translation by Megan McDowell, and Lindsey Drager’s The Lost Daughter Collective (Dzanc Books). 4th Estate has pre-empted a novel inspired by Marilyn Monroe and her Korean translator. Helen Garnons-Williams, publishing director at the HarperCollins imprint, acquired UK and Commonwealth rights in Marilyn and Me by Korean novelist and screenwriter Ji-min Lee,in a pre-empt from Barbara Zitwer at Barbara Zitwer Agency. The translator is the Man Asian Literary Prize-winning translator Chi Young Kim. 4th Estate will publish Marilyn & Me in Spring 2019. Set in 1954, in the aftermath of the Korean war, Marilyn and Me unfolds over the course of four days, when Marilyn Monroe took time out from her honeymoon with Joe DiMaggio to tour Korea, performing for the US soldiers stationed there. Her translator is Alice, a typist on the US base - where she is the only Korean woman making a living off the American military without being a prostitute - although everyone assumes she is. As these two women form an unlikely friendship, the story of Alice’s traumatic experiences in the war emerges, and when she becomes embroiled in a sting operation involving the entrapment of a Communist spy she is forced to confront the past she has been trying so hard to forget. Lee is a screenwriter in Korea and author of several novels while Chi Young has translated various books including Please Look After Mom (Knopf) for which she won the Man, Asian Literary Prize in 2012, The Hen Who Dreamed She Could Fly (Penguin) and The Good Son (Penguin). Garnons-Williams described Marilyn & Me as “a compelling and surprising story of damage and survival, grief and unexpected solace”. The news follows another 4th Estate acquisition of a Korean crime thriller in March, snapped up by commissioning editor Anna Kelly as part of a five-way auction. Korean authors are reportedly “reinventing the thriller” according to the Guardian, introducing an alternative to Scandi Noir. The Man Asian Literary Prize was an annual literary award between 2007 and 2012, given to the best novel by an Asian writer.